There are 10 ultra bright white LEDs in each unit giving a long service life and low power consumption. USB powered, no need for batteries . choice of Black, Blue, Red, Gold, Purple & Silver . low power consumption . TRIXES Flexible USB Blue LED Display Desktop & Laptop Clock Fan. Just plug it into a spare USB port on your computer and you will have an LED clock that is actually a fan with separate hands for hour, minutes and seconds. 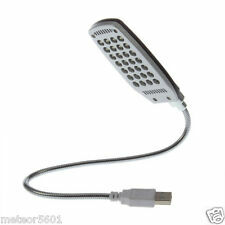 TRIXES 10 LED Flexible USB Laptop Keyboard Light. Kindle Accessories. This light is perfect for lighting keyboards and reading books in low light. 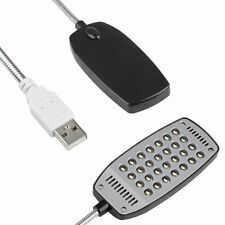 It can be plugged into any USB port for power. PC & Laptop Accessories. Mini USB LICHT/Leuchte WEISS! Diese Mini USB-Leuchte können Sie direkt an einem USB Port anschließen! PC, TV, Auto oder Notebook! Lange Lebensdauer! Und einen sehr geringen Energiebedarf (0,3 Watt). 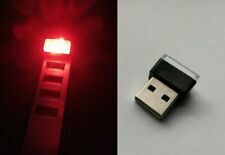 Mini USB LICHT/Leuchte ROT! Diese Mini USB-Leuchte können Sie direkt an einem USB Port anschließen! PC, TV, Auto oder Notebook! Lange Lebensdauer! Und einen sehr geringen Energiebedarf (0,3 Watt). 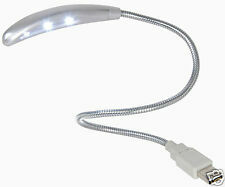 Small portable USB LED lamp, perfect for keychains! (actual item may vary in colour). (Bright White LEDs). Schließe ihn einfach an einen USB-Port Deines Computers an und genieße die kühle Brise. USB Mini-Ventilator 92mm . Kabel & Adapter. Lüfter 40mm. Lüfter 60mm. Lüfter 70mm. Lüfter 80mm. "Leicht und kompakt.". Modelled after a sandwich cookie. Brightness: (2500mcd/30) 10pcs. 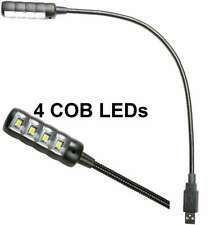 Features: Portable USB LED lights. Model Number: Reading lamp 01. Light Source: LED Bulbs. 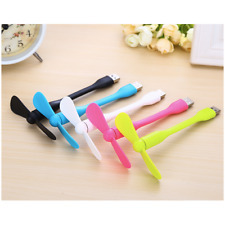 Suitable for: Power bank/laptop/computer/Notebook/All USB interfaces. Battery Type: None. This super cool clock is here to wipe that sweat off your brow (not literally, but it could prevent this ever happening). Plug the LED Clock Fan into any USB port and it will power the fan to send a cool breeze your way. Lamplight: White. Light Source: LED Bulbs. Type: Night Light. Light: 1000mcd. Model Number: ZK415605. Body Material: Plastic. Power Generation: Always On. Power Source: AC. Quiet and Stable --- Adopting an optimized motor with unique noise reduction, it's super quiet for a mini fan. 3 rubber cushions at the bottom keep the fan in its place while working. Adjustable Angle --- The fan is able to swivel forward and backward. New Usb Led Clock Mini Fan DC 5V With Real Time Temperature Display Desktop 360 Cooling Fans For Home Office Product Details Item specifics --- Model Number: Fan --- Type: Vacuum Cleaner Parts Product Description Brand Name: Other material: metal Type: USB fan Model: Other Type: Mini USB LED Clock Fan Size: 16cm x 11cm x 17cm Input / Output Voltage :: DC 5V Input current:: 0.5A Output power: 2.1W Features: Home and travel settings, USB plug and play, on/off switch Colour: Black Products include: 1* LED fan (with USB charging cable) 1 manual Only the above package content, other products are not included. Note: Light shooting and different displays may cause the color of the item in the picture a little different from the real thing. The measurement allowed error is /- 1-3cm. Packaging Details --- Unit Type: piece --- Package Weight: 0. USB MINI LAMP. 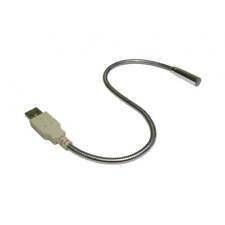 FOR USE WITH ANY USB PORT.